This weblog documents the activities of Pacific Agricultural Genetic Resources Network (PAPGREN), along with other information on plant genetic resources (PGR) in the Pacific. The myriad varieties found within cultivated plants are fundamental to the present and future productivity of agriculture. PAPGREN, which is coordinated by the Land Resources Division of the Secretariat of the Pacific Community (SPC), helps Pacific countries and territories to conserve their crop genetic diversity sustainably, with technical assistance from the Bioversity International (BI) and support from NZAID and ACIAR. SPC also hosts the Centre of Pacific Crops and Trees (CEPaCT). The CEPaCT maintains regional in vitro collections of crops important to the Pacific and carries out research on tissue culture technology. The CEPaCT Adviser is Dr Mary Taylor (MaryT@spc.int), the CEPaCT Curator is Ms Valerie Tuia (ValerieT@spc.int). Click on the thumbnail to see a map of the locations of Pacific genebanks. Click here to download a regional directory of genebanks in the Pacific, including information on their location, contact details and holdings. TaroPest is a computer based information and diagnostic package for taro pests in the South Pacific. This project combined the expertise of researches from Fiji, Papua New Guinea and Australia initially, later expanding to include expertise from across the region. 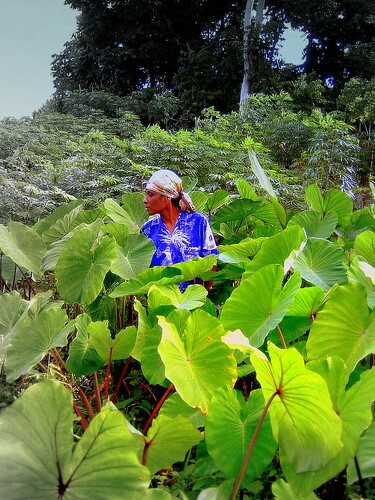 As a summary of knowledge on the regional pests and diseases of taro, this monograph is an outcome of the TaroPest project, which itself built on many earlier taro pest-management projects. It is an illustrated guide to pests and diseases of taro in the South Pacific and it captures the work and knowledge of many researchers and field officers. TaroPest is a joint collaboration between Papua New Guinea National agricultural quarantine and Inspection Agency, the Secretariat of the Pacific Community Plant Protection Service and the Queensland University of Technology in Australia. Core Funding was provided by the Australian Centre for International Agricultural Research (ACIAR). ALONG the Savusavu highway Jugun Kishore's house cuts a demanding presence on a hillside with smoke constantly billowing from a huge copra dryer right beside it. Late at night when the world is in slumber, Jugun can be found stoking his copra dryer with firewood. "I just mix myself a basin (yaqona) to keep me awake and sometimes I have friends over for company," he said. It's a cutthroat business when almost every second family along the highway depends on it. Consistency and hard work are the key Jugun believes one needs to keep ahead in the game. Every one of the villagers surrounding Belego Estate area where Jugun lives knows him by name - from the young to the old. It's no wonder then that he's had a strong rapport and business relationship with them on a daily basis. "They sell me copra and I supply Copra Millers." But 'Keni', as he is sometimes called, never grew up a copra farmer. His life began on a rice farm, hundreds of miles away at Tabia in the Natewa Bay area. Life as the son of a small scale rice farmer at Tabia in the1960s was difficult with less value placed on education than knowing the intricacies of rice farming from a pretty early age. "I can remember by the time I was four years old, I was required on the farm," he said. "When I was in Class One, I would help my father on the farm before I went to school. "Sometimes I would be still helping my father when I would see other children walk by to school about two kilometres away." "Then after I was done, I would quickly have my shower and run after the other children and most times they would be already in classes. "My younger brother was the brains of the family, so they wanted him in school while I only went up to Class Eight and then worked on the farm to help pay for his education." That responsibility didn't make him bitter, instead it taught him about hard work and to want something better for his children. Seven years ago he sold off the farm at Tabia and moved to Belego because he wanted his children to achieve the highest level of education and afford a comfortable life, far from the back-breaking labor of farming. Today his estate is spread over 16 acres of freehold land at Belego, he has a shop running, a yaqona farm booming. He is a leading copra entrepreneur and his children are tertiary qualified. He shared parts of his story in Fijian and his mastery of the language was amazing. "Ka bibi meda cakacaka vakaukauwa ena veivanua kece ga ni cakacaka eda veiqaravi kina," he said which roughly translates as 'hard work is important regardless of the kind of work'. Although not very old in the copra business, something else this 49 year old man had to share was the importance of maintaining enduring relationships with his suppliers who are mostly villagers. "I've lived my life with mostly indigenous Fijians and I know that 'ka bibi' ga na veilomani'," he said. "Always maintaining good relations not only means I get a good supply of copra but I also have fewer problems on my hands." "And it all takes hard work, working hard on my copra business, working hard on the farm, working hard putting my children through school and working hard at being good to others. "Hard work is wealth," he said. Unless water occupies a more central role in decisions regarding crises such as climate change and food security, a global water shortage could ensue — leading to political conflict and insecurity, says a new report. It summons leaders in government, the private sector and civil society to put water at the heart of their thinking, stressing water's essential role in achieving sustainable development and the Millennium Development Goals. The report, 'Water in a Changing World', is an assessment of global freshwater resources prepared by the World Water Assessment Programme under the UN Educational, Scientific and Cultural Organisation (UNESCO). It says that awareness of the potential severe water shortages has not diffused into the wider political community. It also highlights a major research gap in understanding water resources, particularly in developing countries, and warns that incomplete data is leading to incorrect predictions. If water is not linked to other problems such as the food crisis "other crises may intensify and local water crises may worsen, converging into a global water crisis and leading to political insecurity and conflict at various levels", the report says. It urges policymakers who are responsible for key decisions on development objectives and financial resources to act immediately on such grounds. The report also calls for a more holistic approach to predicting future pressures on global water resources, branding existing predictions "outdated, incomplete or sectoral". All external threats to global water resources — including natural forces such as climate change and human factors such as population dynamics, increasing international trade in goods and services, and individual lifestyle changes — should be incorporated into predictions, it says. "Drivers should not be considered in isolation of related socioeconomic and political factors or of other drivers." More complete data on water quantity and quality is also required if water resources are to be properly managed and future needs accurately estimated, according to the report. It says that while technologies such as remote sensing and modelling have made significant advances, these gains are hampered by an inadequate ability to validate observations on the ground. "There is little doubt that global hydrologic data are inadequate in both spatial coverage and frequency of observations. Moreover hydrologic observation networks are worsening in many countries because of changing national investment priorities and declining human capacity," the report says. "Synthetically-generated data cannot substitute for real-world observations." And policy and security issues, a lack of protocol and limited physical access to data means that data are not being shared — hindering regional and global projects that rely on shared datasets, and causing observational gaps. The report, presented today (12 March), is accompanied by a series of case studies on selected countries including Cameroon, Sudan and Swaziland. Very important informative report.Thanks for sharing..
COPENHAGEN] Renewable energy could play a much larger role in supplying the world's energy needs than previously estimated — but it won't come cheap, according to a new study. The research, presented at the International Scientific Congress on Climate Change in Copenhagen, Denmark, this week (11 March) says that renewable energy could supply 40 per cent of the world's energy needs by 2050. The new estimate is considerably higher than previous projections, which put renewables' share at only 12 per cent by 2030, said Peter Lund, an author of the research from the Laboratory of Advanced Energy Systems at Finland's Helsinki University of Technology. If renewable technologies were given the same government attention and financial backing as nuclear energy was in the 1970s and 80s wind energy and solar power would cost the same as traditional electricity generation by 2020–2025 and 2030 respectively, said Lund. But such ambitious targets require substantial financial investment, Lund warned. The technologies would require global support of US$12.8 billion to US$25.5 billion per year and without this backing wind and solar energy would contribute less than 15 per cent of the world's energy output. "What we need is a complete transformation in the way we produce, consume and distribute energy," Lund told SciDev.Net. Erik Lundtang Petersen, head of the Risø STU National Laboratory for Sustainable Energy's wind energy division in Roskilde, Denmark, said that for the wind sector to deliver its full potential it must focus on efficiently delivering, installing and connecting large amounts of wind power to the grid. But Joyashree Roy, an economics professor at Jadavpur University in Kolkata, India, who has been involved in producing reports for the Intergovernmental Panel on Climate Change, says that these targets are too ambitious. [COPENHAGEN] Global sea levels will rise much higher than predicted by the end of this century, climate experts have warned — a scenario which could have dire consequences for millions of people in the developing world. Just two years ago, the UN Intergovernmental Panel on Climate Change predicted a worst-case scenario rise of 59 centimetres. But the accelerated melting of ice sheets in Antarctica and Greenland caused by faster warming means the worst case is now put at 1.2 metres. A sea level rise of one metre or more is predicted to have a devastating effect on major coastal cities, island states and populous delta areas such as those in Bangladesh and Myanmar. A panel of experts speaking yesterday (10 March) at the International Scientific Conference on Climate Change in Copenhagen, Denmark, warned that without efforts to curb the rise of greenhouse gas emissions, sea level rise would expose most parts of the world to greater storm surges — increases in local sea level caused by the winds of storms — threatening lives and infrastructure. John Church, a scientist at the Centre for Australian Weather and Climate Research in Tasmania, Australia, and lead speaker at the session, explained that the most recent satellite and ground-based observations show that sea levels are continuing to rise at three millimetres or more per year since 1993 — a rate well above the average in the twentieth century. "It is becoming increasingly apparent from our studies of Greenland and Antarctica that rising temperature has contributed significantly to the observed sea level rise through thermal expansion of sea water and widespread loss of land ice," said Church. He said that further warming could trigger polar ice cap melting. "We cannot prevent all sea level rise. We will have to mitigate and adapt to avert the most extreme scenario. The least developed nations are at most risk," Church told SciDev.Net. Stefan Rahmsdorf of the Potsdam Institute for Climate Impact Research in Germany said that by 2200, the sea level will have increased by an estimated 1.5 to 3.5 metres. "Ice sheets are melting faster, and sea level rise is a huge threat unless we stop the warming," Rahmsdorf told the press. Kochi: Coconut production in the nation is set to take a quantum jump thanks to a rapid increase in productivity. Increased yield from a more or less stagnant farming area has also placed India as the number one nut producer in 2006-07, with a production of 1,584 crore nuts. India has pushed Indonesia and Philippines to the second and third spots respectively. India ranks number one in productivity among other coconut growing countries in the world. The average productivity of coconut in the country is 7,608 nuts per ha (2005-06) and 8,165 nuts per ha in 2007-08. Among the four major coconut growing states, Tamil Nadu has the highest productivity (13,133 nuts/ha), Andhra Pradesh has a productivity of 8,577 nuts/ha, followed by Kerala (7,046 nuts/ha) and Karnataka (3,139 nuts/ha). The area under cultivation has more or less stagnated over the years, and with coconut oil prices decreasing, it is unlikely to show an improvement in the short-run, traders say. In 2003-04, 1,933,700 hectares were under coconut cultivation and in 2005-06, the area under cultivation improved marginally to 1,946,800 hectares. Kerala is the main coconut growing state, with an area of 897,800 hectares, followed by Tamil Nadu (370,600 hectares) and Karnataka (385,400 ha). Sources say that Tamil Nadu is likely to emerge the largest producer within a short span of time, given that the area under cultivation is decreasing in Kerala. Production has become unviable in Kerala, while productivity gains have helped Tamil Nadu stay profitable despite the lowering of coconut oil prices. Root crops and vegetable prices have become cheaper than immediately after the flood, says a market vendor. Premila Devi Singh, a vegetable vendor and middleman at the Namaka Market in Nadi said prices had reduced greatly since the time of the flood. “At least now we can afford to buy vegetables compared to the period just after the flood. At that time 25 kg sack of eggplant cost up to $70 and now it’s only $25. Right now, long bean is the expensive vegetable and tomatoes and cabbage are still out of season,” she said. Rajendra Kumar said prices were still expensive for certain vegetables that were not in season. “At the moment, pumpkin, cucumber and kheer are not in season so it’s rather expensive. The more expensive the vegetable or root crop, the less profit we make because we cannot increase the prices too much that it becomes unaffordable for the customers,” he said. He said sometimes they were barely able to make profits from selling non-seasonal vegetables but they still chose to buy it for the sake of consumers. Ibadan, Nigeria - Yam farmers across Africa could look forward to better days ahead with the development of a tuber-less yam propagation technique by IITA and partners. In this innovative approach, yam is propagated through vine cuttings, with carbonized rice husks as the growth medium. By eliminating the use of tubers, more yam is made available for food or for sale while signficantly lowering the risk of nematode infestation akin to using tubers as planting material. The technique also promotes faster multiplication and better and more uniform crop quality. In the traditional system, tubers used as seed take up 30 to 50 per cent of the production cost. It is also quite inefficient: the resulting multiplication rate is only about 1:5-10. By comparison, cereals, for instance, have a propagation ratio of about 1:300. “Our goal is to reduce the amount of yam tubers invested as seeds so that farmers will have more food and make more money,” says Dr Hidehiko Kikuno, IITA Yam Physiologist and project leader. He adds, “Another good thing about this technology is that the propagation medium - carbonized rice husks - could be obtained by farmers cheaply, even for free”. The technology, which offers mass, rapid, clean and cost-effective method of multiplying yam, could effectively address the need for fast and wide distribution of high-quality improved varieties in order to meet the increasing demand for the crop. Yam is a major staple in Africa. Average daily consumption per capita are highest in Bénin (364 kcal), Côte d’Ivoire (342 kcal), Ghana (296 kcal), and Nigeria (258 kcal). According to the FAO, in 2005, an estimated 48.7 million tons of yam were produced worldwide, with sub-Saharan Africa accounting for 97 per cent of this figure. The dietary and economic importance of the starchy tuber crop is also on the rise in a number of countries in Asia, Latin America, the Caribbean and Oceania. The research is funded by the Japanese government, the Sasakawa Africa Association, Tokyo University of Agriculture and the International Cooperation Center for Agricultural Education, Nagoya University, Japan. Partners include the Tokyo University of Agriculture, National Root Crops Research Institute - Umudike, Nigeria, Crop Research Institute, Ghana and the Institute of Agricultural Research for Development, Cameroon. A WORKSHOP aimed at addressing food safety issues is being held in Honiara this week at the Ministry of Health. It looks at food production, processing, storage and distribution. The workshop expects to come up with a national policy on food safety, security and nutrition. The Integrated Food Safety, Nutrition and Food Security workshop was organised to look into a draft food safety policy the cabinet endorsed in June 1998. Participants will assess what has been achieved and what has not in order to improve food safety issues in the country. They expect to come up with a Food Standard Regulation that local industries will follow. Under Secretary Ministry of Health Dr Cedric Alependava said the country needs to consider how best to increase the local capacity to grow traditional food. He said to enhance food safety, improvement of agriculture practices must be considered. “Food and Agriculture Organisation (FAO) and Ministers of Agriculture of the Pacific have recognised the importance of taking action on food security,” he said. He said this will be an issued Pacific island leaders will consider this year during the Leaders Forum in Australia. Dr. William Adu-Krow of World Health Organisation (WHO) said malnutrition is currently increasing in the Pacific due to rapid growth, inadequate diets, parasites and diarrhea. He said to attain food safety, agriculture, health, food industry and trade sectors must work together to ensure the production is safe and well observed. The workshop will explore current food safety and security in the country, pathways forward for food safety, identifying principles, aims and strategies to be included in the policy. Reps from the Government, private sector and other stakeholders are attending the workshop. Is H2O the new CO2? Up to this point, oil and resulting C02 emissions have gotten most of the attention, but many experts warn that declining water supply and failing water infrastructure globally may soon become the world’s next major crisis if meaningful action isn't taken soon. The lush landscape of Hawai‘i once offered abundant food. What can these islands teach us about food and sufficiency? The island of Kaua‘i is one of the most beautiful and fragile places on earth. From above, it looks like a vibrant green flower, lush and pulsing with life, floating in the middle of the Pacific Ocean. The Hawaiian tourist industry calls it “The Garden Isle,” comparing it to the Garden of Eden. The image of Hawai‘i has always been sold as a “paradise.” But there is another side to life on this island, one that visitors rarely see. The west side of this tiny island is home to the U.S. military’s Pacific Missile Range and testing grounds, part of the longstanding military occupation of the Hawaiian islands, and to the headquarters of giant agrochemical corporations Syngenta and Dupont. These corporations test and produce genetically modified crops on former sugar plantation lands here and throughout Hawai‘i, along with toxic herbicides, insecticides, and fertilizers. It is the very worst of America’s “agrochemical military industrial complex,” imposed on the ancient homelands of a rich traditional farming and fishing culture, in the midst of some of the world’s most precious biodiversity. When I visited the west side of Kaua‘i in 2006, the local newspapers were full of reports of children from Waimea Canyon School who had been sickened by chemicals used on nearby test plots. As many as 60 people were affected, including teachers and staff. It happened again in 2007, with school children suffering nausea, headaches, and dizziness. In 2008, for the third time in three years, chemicals being tested for industrial agriculture sickened children and adults and sent them to clinics and the emergency room with tears in their eyes, holding their heads in their hands, or vomiting. The corporations responsible for the tests deny any role in the incidences. But the open air testing of chemicals and genetically modified crops is a now a persistent worry for people living in this small rural community. Local activists have suggested that the welcome sign at the Kaua‘i airport be changed to warn tourists of what is going on there: “Welcome to the Mutant Garden Island.” Instead of being a source of health and well-being for the land and people, the American system of industrial agriculture has become a source of problematic food and even fear. The connection to the military is the key to understanding how this tragedy came about. Most of the toxic chemicals used in agriculture came from the implements of war, such as nerve poisons and defoliants developed during World War II. And our military has been repeatedly used to impose our system of industrial agriculture on other lands, depriving traditional farmers of their livelihoods and redirecting their natural resources to the use of U.S. business interests. American plantation owners used the military to force the monarchy of Hawai‘i out of power. The takeover of Hawai‘i-the imposition of plantation agriculture on Hawai‘i’s traditional system and the conversion of the Hawaiian people to a Western lifestyle-is a case history and a warning for all of us concerned about the future of food. We are facing an urgent problem: Given global warming, growing populations, and declining natural resources, how will we feed ourselves? Before colonization, Hawaiians had a sophisticated system of land, water, and ocean resource use that fed populations equal to or even greater than those on several of the islands today (excluding the urban populations of O‘ahu). Now, residents of Hawai‘i import 85 percent of their food. The descendants of the first Hawaiians, like most native peoples who have been colonized, suffer from some of the worst poverty and diet-related health problems of anyone living in the United States. The food being imported into Hawai‘i is produced, processed, packaged, and transported using enormous amounts of fossil fuels. By one measure, the current U.S. food system uses 10 times more energy than it produces in the form of food calories. Even if you like industrial agriculture, its built-in obsolescence is a problem. When oil production peaks, and prices rise again, as they inevitably must, food in Hawai‘i will become unaffordable. What will happen when the gas pumps and grocery store shelves are empty? This is a question all of us will face, sooner or later, since we are all on what David Brower called “Earth Island,” a small planet floating in a sea of space. 3 March 2009: The Secretariat of the Convention on Biological Diversity (CBD) circulated its monthly bulletin of activities, including a brief report on the Capacity Development Workshop for the Pacific on National Biodiversity Strategies and Action Plans (NBSAPs), the Mainstreaming of Biodiversity and the Integration of Climate Change, held from 2-6 February 2009, in Nadi, Fiji. ALL school food services, including canteens and dining rooms, must comply with the schools' nutrition policy to reinforce messages on healthy eating. Interim Education Minister Filipe Bole said the nutrition policy must be aligned to the ministry canteen guidelines. Junk food should be avoided at all costs because the magnitude of nutritional problems has led to high levels of overweight and obesity, iron deficiency anaemia and high blood pressure in all age groups. A bill that seeks to retain the cultural integrity of taro by protecting it from genetic modification unanimously passed it’s House Agriculture Committee hearing in Hawaii this week. During the debate this week researchers said science could shield taro from devastating diseases while Native Hawaiians sought to keep taro pure and safe from tampering. The taro security bill is setting out to protect the cultural integrity of taro as part of the heritage of the Hawaiian people and the State, but the bill still allows for genetic alterations of non-Hawaiian taro varieties in a laboratory. But some taro farmers voiced concerns to legislators that genetically modified taro varieties could still cross-pollinate with Hawaiian varieties. It now heads to a vote before the full House. This is the third straight year that lawmakers have tried to pass a law protecting Hawaiian taro, which is used to make the starchy food poi and revered as an ancestor of the Hawaiian people. The Northern Marianas College Cooperative Research Extension and Education Services program will be conducting a two-day Banana Workshop on the islands of Saipan, Tinian, and Rota. The workshop, which is open to the general public, will highlight the disease management, maintenance, and care of the varieties of bananas in the CNMI. The workshop will also host University of California at Davis professor Dr. Ivan Buddenhagen as the guest speaker. Buddenhagen, who holds a Ph.D. in Plant Pathology from Oregon State University, has dedicated most of his long career to promoting plant disease resistance and management as well as production and crop improvement of bananas and other tropical crops. The Banana Workshops will be held on Saipan at the Pacific Islands Club on March 16-17, on Rota at the As Paris Restaurant on March 18-19, and on Tinian at Classroom D at the NMC-Tinian Campus on March 20-21. A registration fee of $5 is required to attend both days of the workshop session, which will run from 8am to 4:30pm each day. The workshop sessions will consist of presentations in the morning and a field trip to banana farms for a hands-on experience in the afternoon for both days. The government is carrying out testing on the technical viability of a 20 percent mix of coconut methyl ester (CME), popularly bio-diesel, with petroleum fuel in an aim to help ease down fuel price. Philippine Coconut Authority Deputy Administrator Carlos Carpio said PCA is conducting technical tests of the higher mixture of CME with petroleum-based diesel particularly as requested by the local government of Lucena City, Quezon. "We need to study the technicalities in using it without engine modification. We will also study (benefits) like (increased) mileage," he said. Mayor Ramon Talaga, Jr. wants his local government or the entire Quezon province to be the bio-diesel capital of the Philippines, hence the tests. Quezon province may really be the right province to pursue a higher CME mix as it is one of the Philippines&apos; biggest coconut producers, producing higher than the whole of Bicol Region. The 20 percent mix will be a big leap from the present one percent mandated mix of CME with diesel. The Biofuels Act mandates the higher mix of two percent by 2009, but that is still way below Lucena City&apos;s objective. Chief investigator Associate Professor Sergey Shabala said salination causes multi-billion dollar losses to the crop farming industry. Up to seven per cent of the total land surface is saline and about one-third of the world’s irrigated land suffers from secondary-induced salination, he said. Previously plant breeding for salt tolerance has achieved only a limited success, mainly due to the physiological and genetic complexity of salinity trait. “Traditionally, plant breeding for salt tolerance followed two main avenues”, Assoc Prof Sergey Shabala said. “One was to make sure that plants don’t take up sodium, and another one – to synthesise some chemicals to help them to withstand the water stress imposed by salinity. Unfortunately, neither of them was efficient enough”. Now Assoc Prof Shabala and his team at the School of Agricultural Science believe they are getting close to solving this problem. In a project funded by the Australian Research Council and Grain Research and Development Corporation, the scientists have explored some other mechanisms contributing to salinity tolerance in plants. One mechanism, related to plant’s ability to keep a constant level of potassium within its tissues, seems to be crucial to make plants salt tolerant. “It appears that we have found a ‘missing link’ in this puzzle”, Assoc Prof Shabala said. “As far as plants are capable to keep potassium high, they are happy. And all other mechanisms discovered so far appear to be complimentary to this one”. The National Land and Water Resources Audit estimates that somewhere between 10 and 25 per cent of currently arable land could be out of production by 2020. So creating salt tolerant varieties is critical for both reclaiming already salinised land and for minimising the overall cost of dryland salinity in Australia which may exceed $1 billion by 2100. Assoc Prof Shabala and his team believe that targeting potassium in plant breeding for salt tolerance opens new and exciting prospects to overcome salinity problem and create tolerant varieties. “Given the large amount of contributing components, it’s a painfully slow process,” he said. Rare crops found in the Pacific islands and former British colonies should be grown in much larger quantities to help the world avoid food shortages, a leading expert on plants has warned. Professor Stephen Hopper, director of the Royal Botanical Gardens at Kew in London, said people needed to start eating rare crops like breadfruit, cowpea and Bambara groundnut. He said cultivating species such as breadfruit, grown on trees native to the South Pacific islands, and bulrush, whose roots were a popular carbohydrate among indigenous Australian aborigines, could also help preserve biodiversity. He argued that the world was too reliant on a handful of key species of edible plants for food, warning that the combined threat of disease, climate change and lack of diversity in commercial crops had left the dozen staple species that provide the bulk of the global food supply - such as wheat, maize and barley - increasingly vulnerable. Professor Hopper predicted that crops such as breadfruit, a fruit grown in British colonies in the 18th century as a cheap foodstuff for slaves, Barbados cherries, Bambara groundnuts, cowpeas and pigeon peas were among the crops that had potential to become future staples. Famine has become an ever more frequent condition facing the world, particularly in heavily populated but marginal desertifying lands most susceptible to global warming. "Food shortages are inevitable in such circumstances and will be exacerbated as the human population increases globally. "The world is currently fed primarily from just a dozen species - around 80 per cent of the world's food comes from those few plants used in commercial agriculture. Yet there are more than 30,000 edible plants known on the planet, so it is baffling we are so reliant on so few species. "Diversifying the range of crop species is a sensible approach and could ensure food is available from alternative crops should staples fail in any given season." Professor Hopper spoke out after giving a speech about biodiversity to business and government officials at the 2009 Sustainability Summit organised by the Economist magazine in London in February. He said industrialised agriculture mass produced crops such as wheat, rice, maize, barley, oats and potatoes, which were the main staple forms of food around the world, at the expense of other types of plants that were cleared to make way for these crops. As global temperatures increase, many areas that grow these crops will become unable to sustain them. Low genetic diversity in these staple food crops through generations of breeding has left them vulnerable to disease and pests. 03 MARCH 2009 CANBERRA (Pacnews) ---- A group of Australian scientists is helping to save a tiny central Pacific island nation from a dangerous byproduct of rising sea levels. Kiribati is slowly being swamped by salt water, shrinking the land mass and threatening the islanders' precious supply of fresh water stored in underground reservoirs. A team of experts from the Australian National University (ANU) in Canberra has devised a plan to help the small nation of 100,000 secure its water supply against seawater and other contamination. “They're living in a precarious situation in terms of their water resources,” said project leader and environmental expert Professor Ian White. Kiribati is made up of 33 atolls, almost all of which sit just six metres or less above sea level. The nation, which has strong ties to Australia and uses the Australian dollar, is considered one of the most vulnerable to climate change in the world, along with Tuvalu and the Maldives. It was one of the first countries selected by the Global Environment Facility to trial new strategies to adapt to climate change, but a recent survey showed water supply was the biggest and most pressing concern. Prof White said investigations revealed the underground water supply was in danger of being tainted with salt water or becoming polluted as reservoir areas became more built up. This was particularly true in urban areas with a density of 12,000 people per square kilometre, significantly more than in Sydney's Kings Cross. “They have very limited land areas and they're all living over the fresh water reserves and because these atolls are very porous, things get in the water very quickly,” Prof White said. The new water policy, developed in partnership with Fiji and France, aims to conserve water through sustainable use and efficient management. The Pacific nation, where illegal logging is rampant, has recently tried to overhaul its image in the conservation community, taking the lead on such issues as getting tropical forest protections included in a U.N. climate pact. The plan for a conservation area stemmed from an unusual agreement between the government and 35 indigenous communities to protect the 187,800 acres of remote tropical forest, coastal reefs and mountains on the island of New Guinea. Leaders representing the 10,000 villagers living in the YUS Conservation Area, named for the Yopno, Uruwa and Som rivers that run through it, have agreed to prohibit hunting, and development such as logging and mining. In exchange, the Seattle-based Woodland Park Zoo and the Virginia-based Conservation International will provide as much as US$2 million for health and education programmes. “By creating the country's first national conservation area, the PNG government and people have established a much-needed safe zone for the irreplaceable biodiversity it contains,” said Lisa Dabek, the field conservation director at the Woodland Park Zoo and one of the world's top experts on the tree kangaroo. “They are completely adapted to living in the rain forest and trees, which is not what you think of when you think of kangaroos,” said Ms Dabek. He has spent more than 20 years studying the animal, which is found only on the island but is related to tree kangaroos found in Australia. Other rare species in the area include the long-beaked echidna — an egg-laying mammal that looks a bit like a hedgehog — and the Huon Astrapia, a bird of paradise. Until now, their habitat was under significant threat. A study last year in the journal Biotopica found that nearly a quarter of Papua New Guinea's rain forest had been damaged or destroyed between 1972 and 2002 — mostly due to illegal logging to extract timber that is made into flooring and furniture in Chinese factories and sold in the United States and Europe. But many of Papua New Guinea's forests, including the new reserve, are still untouched, and researchers have hope the unique arrangement will find success. Unlike government-run parks that often exist in name only in many parts of Asia, the land committed for the project is all owned by local clans. Conservationists are counting on the locals to bring a unique commitment to protecting their homes. Researchers said the reserve is also a good first step toward reducing global emissions: The trees in the reserve absorb 13 million tons of carbon each year while deforestation globally represents about 20 percent of carbon emissions. “Hopefully, other tropical forest nations will follow this example of simultaneously combating climate change and conserving the ecosystems on which people depend,” Conservation International President Russell Mittermeier said in a statement. [RIO DE JANEIRO] Making articles freely available online can widen the participation of developing world scientists in global science, according to a new study. Researchers at the University of Chicago in the United States measured the extent to which making papers available on an open access basis affected how many times those papers were cited, and by whom. Using Thompson Scientific's Citation Indexes and Fulltext Sources Online, they surveyed 26 million articles from more than 8,000 journals, their associated citations from 1945–2005 and online availability from 1998–2005. They compared the number of citations scientific papers received when available only in print with the number received by the same articles once they became freely available online. The researchers found that online availability increased citations of recently published articles by around eight per cent. But they also found variation in the rates of citations from different countries, based on a country's per capita gross national income — with the impact of open access more than twice as strong in developing countries than in developed countries. In England and Germany, for example, open access increased citations of articles by around five per cent, while in India the increase was almost 25 per cent and in Brazil it was close to 30 per cent. "Our study shows that people who have access to journals in poor countries use them," says James A. Evans, the leading author of the research, published in Science last week (20 February). "If they weren't freely available they wouldn't use them with the same frequency, and they may not be able, as a result, to themselves publish in top journals." The researchers also found that the influence of open access dipped back to 12–16 per cent in very poor countries, such as Afghanistan, Uganda and Nepal. Agrobiodiversity Weblog: For discussions of conservation and sustainable use of the genetic resources of crops, livestock and their wild relatives. PestNet: For on-line information, advice and pest identification for the Pacific and beyond. Contact: Grahame Jackson. Pacific Mapper: For on-line mapping of point data over satellite images of the Pacific provided by Google Maps. DIVA-GIS: For free, easy-to-use software for the spatial analysis of biodiversity data.